Unlike last January, where I tried to lead a frugal nun-like existence, I did no such thing this time round – it was just a really quiet month social-wise, with only one cheeky ‘beer and Nando’s’ session after work on pay day. All other weekends, I went to the gym or stayed at home, slowly making my way through the alcohol in the house, reading a little and re-watching (and enjoying) old episodes of Doctor Who (I started from the Christopher Eccleston series). Oh, I did go on my first walk of the year – a 6-mile flat trek along the Bridgewater Canal in Warrington, which was very pleasant. I wore my new waterproof jacket and walking trousers (hand-me-down and a late Christmas present from a family member) so my walking gear is getting a bit more suitable for the good ole British weather! 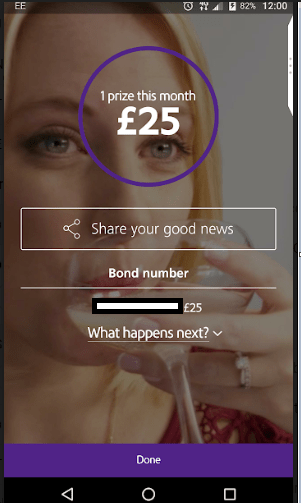 I also got my first Premium Bond win of the year – hopefully, the first of many! NS&I’s app informing me of my win! 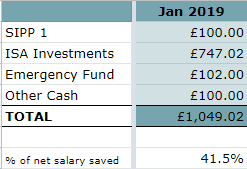 So, how did I get on with my savings in the first month of the year? I saved 41.5%, which is a pretty good start. The above savings includes top ups from £116 matched betting profits (from last month), the £25 premium bond win, £10 lotto winnings, £15 from TopCashback* and £69.02 affiliate income from OddsMonkey (thank you to all who signed up via my links!). 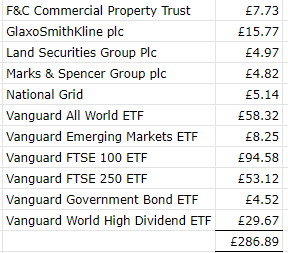 I was vaguely aware that the markets had begun to recover a bit but was surprised to see the extent of that recovery when I ran my numbers – my Future Fund is heading in the right direction again, sitting at £151,358. Whilst not all the losses have been recouped, I’m just glad to have crossed the £150k milestone again! I received £286.89 in total, of which £33.46 was from my ISAs, the rest in my SIPPs. As mentioned before, the MB guide I subscribe to is OddsMonkey*, which is great for beginners and experienced matched bettors alike with quality tools such as the Oddsmatcher, Each Way Matcher, Extra Place Matcher, Dutch Finder, Racing Matcher and Acca Matcher. There are step by step guides and also a friendly forum for you to ask questions and get help on any of the offers. Matched betting isn’t for everyone but you won’t know until you try it! Anyway, check out the free trial* (with no obligations). Good to see my passive income totally trashing my active income (MB) but I really must do better in the MB! I’ve also managed to cross off a few squares in my Book Bingo, and in a month where not a lot happened, this was quite exciting, haha! This entry was posted in Books, Dividend Investing, Earnings, Expenses, Investment Trusts, matched betting, Portfolio, premium bonds, Savings by weenie. Bookmark the permalink. Congrats on passing the £150k milestone again! 🙂 Let’s hope the markets continue to go up. We’re currently making our way through all of the game of thrones episodes again in preparation for the final season. I’ve still got to watch all of the Doctor Who’s in order! Thanks and yes, it’s good to see the markets go up but I don’t want them to go up too quickly, want to continue buying at lower prices! Ooh, good call on GoT! I got as far as re-watching the first 3 seasons when the last one ended but I may pick it up again, in preparation too! Can’t wait! Have been loving the Doctor Who – I’d forgotten how much I enjoyed the Tennant era! Good job on keeping it restrained in January. I tend to be so miserable this month I never turn down an opportunity for frivolity. I hate this month and this year it seemed to drag on forever. I’m hoping for better things in February (flat completion and getting on the next saving phase of my life). January isn’t a great month but I think I prefer it to be quiet than the other way round. If I were an animal, I’d probably like to hibernate! It does drag on though, more probably because it feels like it’s a long time before it’s pay day. Good luck for the flat completion this month! Well done weenie a great start. We’re determined to have a quieter year this year. While not in to buying stuff I do sometimes go overboard in booking experiences and the tail end of last year was definitely a case of too much of a good thing. We are also wanting to leave time to catch up with friends and family a bit more. I’ve booked to go to Spain in May and I’m doing download festival again but other than that no plans other than friends over for Sunday lunch and a meal out planned for next weekend. This year is potentially going to be a bit spendy anyway as we’re doing some much needed house renovation and I’m saving for that. My dad’s kindly gifted me a chunk of the cost which for once I’ve decided to accept to keep my investments intact (plus they help my step sister out a huge amount which is fine and I am not bothered about being equal as she’s in a very different position to me, but he said it goes a little way to redressing the balance lol). I’m also saving to change my car at year end and will decide closer to the time whether to do this with a loan or buy outright. And nice one, I’ve always wanted to go to Download but none of my friends are into the music, so I’ve always had to go for more mainstream, ie Leeds or V. Although I don’t think fesitvals are in my budget this year. Good luck with sorting out the house renovation and hope it stays within budget. It makes sense to park the BTL idea for now, I’m of the view that you don’t want to go into it in a half-hearted manner especially as you have other things to consider, such as your client’s small business – that sounds really interesting, what kind of business is it, if you don’t mind me asking? I for one Weenie am glad you didn’t live a nun-like existence! Although who knows, maybe there are some radical nuns around? Glad you are getting out and doing some walking – I always enjoy canal walks, the history is superb (geek alert). And congrats on crossing £150k again. The markets have been really unable to make up their minds lately…….my portfolio is jumping everywhere too. Haha, I don’t know, I’m sure there are radical nuns about! Funnily enough, after the canal walk, I had a little google to check up on the history – I had no idea that the Manchester Ship Canal went to that part of the country! Thanks for the tip on the EW betting on TFS site. I might join up on the Slack app as you suggest, see if I can regain some lost enthusiasm for Matched Betting. I was gubbed by so many bookies it limited my options and I fell away from it, although I’d won about 3 grand when I packed it in. I still do the odd flutter, so EWS seemed less hassle. Like everything else, I’ve budgeted an amount of money I’m “prepared to lose” trying it out, so we’ll see how it goes. Glad to have helped and good to see you in Slack. Were you able to jump onto TFS’ winning tip? The bulk of my EW betting is done on my gubbed accounts – as long as not restricted too much, eg I can put on at least £4EW, then they are profitable. It’s the ones restricted to pennies that I don’t bother with. Good luck and may the odds be with you! 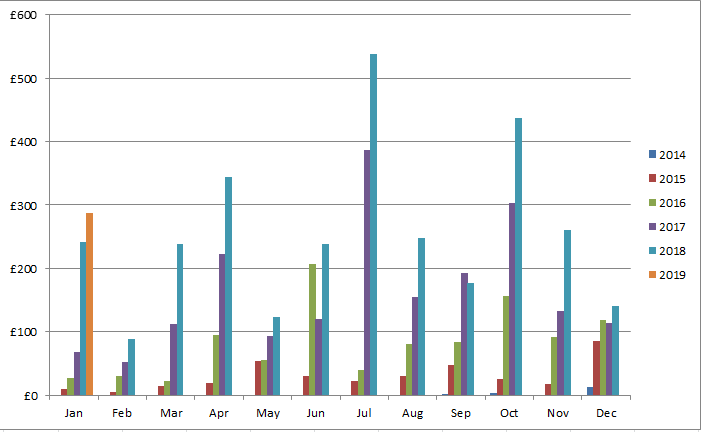 The matched betting has also been slower for us in January as well. I need to join the EW slack group to improve on the profits from that side of MBing. The markets have improved in January as you say but I haven’t checked my figures yet but will do shortly for my update. I think my figures are going to be slow but steady like yours. Slow but steady is how I prefer it, no rollercoasters! I think you’re certain to get to your goal of retiring early. It’s just a question of how long it will take you. PS. I first tried to send this via the comment form on your website but it failed to send. Sorry I meant to say my message via the CONTACT ME form failed to send. I think I lumped VMID into small cap after reading in this old Monevator post that the FTSE 250 tracker could be considered for UK small caps: https://monevator.com/how-to-invest-in-small-caps-passively/. Perhaps not entirely correct but as he says, there’s no consistent definition of ‘small’. I guess I could change to Domestic Small/Mid Cap as a compromise! Also, thanks for flagging the comment issue – I can see there’s an issue but not sure how to fix it. I might take it down and reinstall, see what happens. I’ve amended to ‘Domestic Small/Mid Cap’. Congrats on crushing it up to 150K again, seems we all had a good January, let’s hope that trend will continue over the rest of the year. Right, time for a walk now! huha! Have a nice time Weenie. I downloaded ‘Meetup’ app and joined a local walking group so I can join in on organised walks. I’ve got a hopeless sense of direction so need to follow people who know where they’re going! Worth checking it out to see what local groups are near you, perhaps? Haha, it’s not a savings rate competition! We’re all so different that it’s only really worth comparing your own savings rate! Otherwise you’d be trying to beat Ms ZiYou who’s on around 70% savings rate! There should be walking groups defined by age you can join, eg 20-30 year old, 30-40 etc. The one I’ve joined is the latter – although there are a couple of walkers in their 50s and they are much fitter than I am, haha! And the walks don’t have to be in your immediate vicinity, eg for one of the walks, I went to the Lake District, around 80 miles away. There is definitely something to be said for not living like a nun in January. Especially as it always feels such a long month. Going on holiday this month was a bit of a game changer for me and made a huge difference to how the month panned out. Congrats on the savings rate and getting out for a 6 miler, nothing better than a walk on a crisp winter’s day. I’ve got into the habit of going on holiday early January. Makes such a difference to the post Christmas blues! Although it sounds good to go away, I think if I had the time off, I’d probably just stay at home and chill (hibernate if I could, haha). It wouldn’t be in my budget, so soon after Christmas and just before Chinese NY, which is another expensive time for me. Another bingo moment you can tick.. slaughterhouse 5 has been made into a film in 1972. Good luck with your progress! Ooh, thanks MrMB, I didn’t know that – thanks! Sounds like a good start to the year! January is always a bit hard, the weather and dark nights I always find a bit depressing as Fretful finance mentioned above. Don’t get too hung up on the results of the Acca/EW – you can’t control that but you can control the amount of effort that you put in and I’m pretty sure you’ve done plenty of that judging from the slack group. Sure you’re due a great month soon! Thanks, let’s hope everyone has a great month! Nice to see a decent savings rate start to the year. Also seeing your Future Fund tip over £150k again must feel nice. January has been a month of really knuckling down and focusing on my side hustles. I have to confess after the craziness of December and Christmas I quite like the quiet time for reflection and refocus in January. It always feels nice and fresh and like a new start for me with it being a new year. Good luck for your Feb savings and matched betting. Yes, it was good to see my Future Fund pass the £150k mark again – when the markets dropped, it did feel that my journey was going backwards! I agree, quite time for January, although perhaps I should have refocused a bit more, instead of just binge-watching tv! All the best for your Feb savings and profits! Weenie, I am interested to know your views on overpaying the mortgage. My savings rate is presently only 16%, but would be 35% if I didn’t overpay the mortgage. I have come across differing views about this. Some see it as good debt, others regard not having a mortgage as a sign of financial independence. If you plan to retire early this is one less bill to pay and therefore less money to find in the future. Alternatively, with the low interest rate one may make more money investing the overpayment than one saves on interest on the mortgage. For your info, I don’t have a residential mortgage but if I did, I would make small overpayments but probably concentrate more on investments, just my personal choice. You mention that your savings rate is ‘only’ 16% but that if you didn’t overpay your mortgage, it would be 35%. Both figures are excellent, so perhaps you could track both? PS. Don’t be mad at me if you get a notification saying I unsubscribed from your post notification e-mails – I’m still here, just moving all my blog subscriptions to feedly instead of e-mail! Yes, I’ve enjoyed all the reading I was able to do and need to kind of continue in that vein. Haha, cocktails lead to very messy nights so I tend to avoid them! And no worries re unsubscribing, it’s not like it’s a requirement! Congratulations on getting over £150K again. That must feel good. January is always a good month for taking stock and having a bit more time in the house. My kids have introduced me to Yes Minister and Yes Prime Minister, so we’re watching those. I don’t have the heart to tell them I first watched them decades ago! Yes, it does feel good to be over the milestone again and as I said, it was a complete surprise, I thought it would take a couple of months at least. With streaming etc, young people are enjoying old programmes which we watched the first time round. I guess they just don’t make them like they used to! I do wonder what the Spitting Image team would have made of Brexit, May, Corbyn et al! PS – I only know what ‘Sassenach’ means from watching ‘Outlander’! Hi Weenie – I too am in the North-west. I’m not looking to retire early but am enjoying reading about your journey. I’m interested in your saving strategy and notice you are sometimes disappointed by not reaching 50% as if it is inevitable. I don’t use such a high figure – just 25% for me. But I couldn’t do it for years – and I mean years. Until I read the phrase “pay yourself first” I’m sure you have come across it. Why not just take the 50% out at source and then fit your lifestyle into the other 50%? No excuses then! It annoyed me at first but then found I was forced to make other choices. You are really inspiring and it makes me wonder if I could save for my goals better too. Well done and good luck. Hear what you’re saying, but if I take the 50% out, then I will not have enough to live what I consider a ‘normal life’. I’ve already cut down on what I consider to be unnecessary and unimportant costs and as I’m doing this longterm, I don’t want to make any sacrifices otherwise more of a chance of me just giving up. Last January, I attempted to scale right back to bare bones and achieved a savings rate of 59.3%. However, I felt it unsustainable, not sure it was good for my own sanity to be honest and I didn’t feel happy, despite the high savings rate. In terms of paying myself first, 25% is taken automatically when I get paid so that is what I save as a minimum each month. The rest is then made up of what is left after my spending. Of course, one sure way to save 50% is to get a better paid job, but it’s not something I’m considering. Why even set it at 50%? As mentioned, if I set it lower, then my sights will be aimed lower. I should get a bonus next month, so I will save 50%+. Will see if I can keep it as high as possible! Good job in January! I’ve decided that Premium Bonds are my new jam. Finding new tax free savings options is tricky. It’s not that I mind paying tax, but getting a decent return after tax is really tricky and I am paranoid about getting my tax return wrong! We went for a 3 mile walk in the woods a week or two ago. Each time I get out in the fresh air I’m reminded of how much I love it. Not sure why I don’t do it more often to be honest. Caveman recently posted…January 2019 update: Did I undersell my goals? Good to see another Premium Bond fan and all the best with ERNIE! I like the new Doctor Who but had forgotten how great the stories were in the Tennant era. Or how great Catherine Tate was as his companion! As for the ‘real’ Doctor, showing my age now because my first one is the mighty Tom Baker!